It has become fashionable to deny the therapeutic efficacy of homeopathy in view of a lack of plausibility as to its active principles although pertinent published evidence suggests the opposite. Nevertheless, incorrect information is being launched that implies either ignorance or deliberate polemic propaganda against homeopathy. This publication contrasts three recent examples with the actual evidence available to reveal the lack of seriousness of such activities. 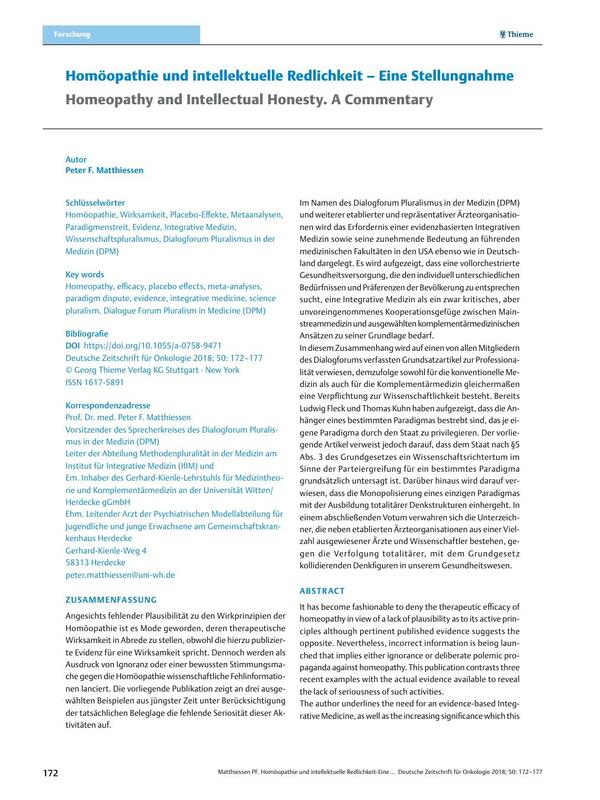 The author underlines the need for an evidence-based Integrative Medicine, as well as the increasing significance which this concept enjoys at leading medical schools in the United States and German alike, on behalf of the Dialogue Forum Pluralism in Medicine and further established and representative medical associations. The idea is to illustrate that a fully orchestrated health care system which aims to meet the individually varying needs and preferences of the population must be based on integrative medicine as a critical but unbiased framework of cooperation between mainstream medicine and selected complementary medical approaches. In this context mention must be made of a fundamental article on professionalism drawn up by all members of the Dialogue Forum, according to which conventional and complementary medicine alike are obliged to adhere to scientific standards. At an early stage, both Ludwig Fleck and Thomas Kuhn pointed out that the proponents of a specific paradigm strive to gain official privileges for their own paradigm. This paper, however, underlines that under Basic Law (German constitution) Article 5 Paragraph 3, the state is generally forbidden to pass judgment on scientific matters in the sense of advocacy of one specific paradigm. In addition, there is the danger that monopolization of a single paradigm fosters the development of totalitarian structures of thinking. In a concluding vote, the signatories of this paper – well-established medical associations and a large number of renowned physicians and scientists – reject totalitarian thought patterns in our health system that are incompatible with constitutional law.